Plumas County is a medium-sized county toward the State's northeastern border. It is primarily mountainous — in the swelter of ranges between the north end of the Sierra Nevada and the growing Cascades to the north — and has a variety of wooded habitats from oaks to firs. Lake Almanor is a major presence in northern Plumas County; in the southeast the county takes in the northern half or so of Sierra Valley. This is a lightly populated area — the primary towns are Quincy and Chester — and it relies on the summer tourist dollars to some extent. Plumas County was created in 1854 from the eastern two-thirds of then-existing Butte County. County birding statistics and links are on Joe Morlan's site. Helen Green's Guide to northern Plumas birding is also on Joe's web site. 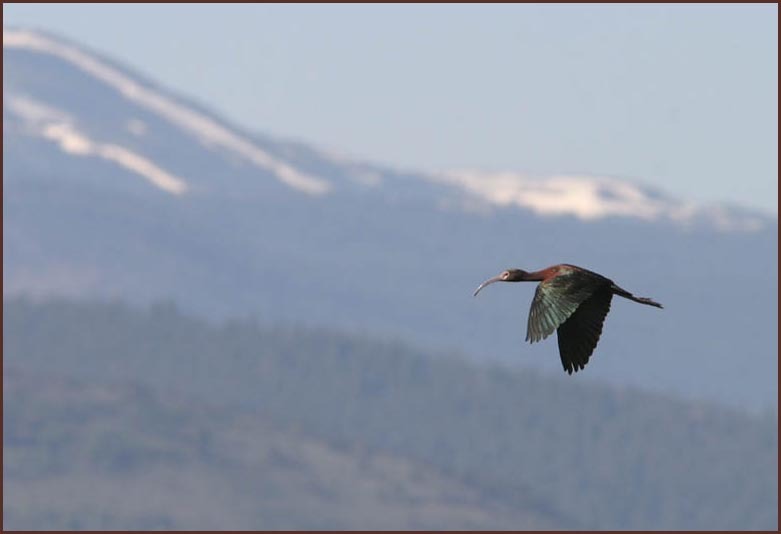 For Plumas County I rather like this flight shot of a White-faced Ibis, flying over Sierra Valley with the snow-capped mountains in the background. 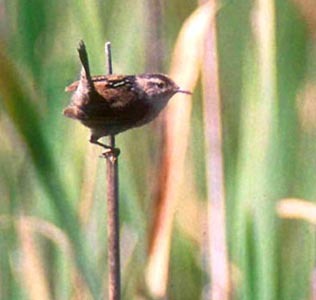 Other nice birds from Plumas include this bird-in-habitat" shot of a Marsh Wren (below right; 19 June 1999 in Sierra Valley) and a singing Townsend's Solitaire atop a tall fir near Humboldt Peak on the Plumas-Butte border (this bird was in Plumas but I was standing in Butte to take the shot). For a scenic photo, I've chosen this lovely meadow-with-aspens scene near Ruffa Ridge in western Plumas (20 June 2006). Almost the entire county is in montane forest, meadow, or lake.